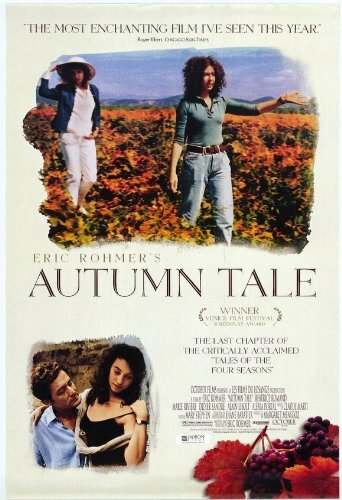 It’s early autumn in the bucolic setting of the southern Rhone valley and Isabelle (Marie Rivière), a bookstore manager, and her husband are planning the wedding of their daughter Émilia (Aurélia Alcais), while her friend Magali (Béatrice Romand), a widowed wine-grower, is preparing for the grape harvest. Concerned that Magali is lonely now that her daughter has grown up and left home, Isabelle secretly places a lonely-hearts ad on her behalf in the local newspaper. Women, like fine wine, improve with age; at least according to Eric Rohmer in this delightful comedy of manners set in the ancient rural landscape of the Rhone Valley in southern France. Focusing, unusually this time, on an older woman and her search for love and fulfilment, Rohmer struck a chord with French cinemagoers, giving him his biggest commercial hit in years. The film also received considerable international critical acclaim, winning the Best Screenplay award at the Venice Film Festival and the American National Society of Film Critics Award for Best Foreign Language Film. The recognition marked a triumphant conclusion to the director’s Tales of the Four Seasons series. Making effective use of the picturesque locale, Rohmer deftly sets the scene in a handful of opening shots. This is an historic landscape in which man and nature co-exist in harmony, and yet, as we shall see, modernity threatens in the shape of farming pesticides and smoking factory chimneys. Both Isabelle and Magali are opposed to this despoiling of their environment. Magali views her winemaking as a craft not a trade and declines to use pesticides on her grapes unlike the neighbouring vineyard owner, whose use of chemicals makes his land more efficient and productive but spoils the taste of the wine. An apt comparison could be made with Rohmer’s approach to filmmaking: his thoughtful small-scale films in which character takes precedence over plot are made in opposition to the mass-produced entertainments of the big studios, but because he refuses to impose a viewpoint or interpretation on what he films, or to enhance reality or manipulate the viewer’s emotions, somehow his films ‘taste’ better. That’s not to say that An Autumn Tale is simplistic or anodyne – far from it. The complex plot, full of surprises and reversals, feels at times distinctly Hitchcockian, especially during the climactic wedding party scene. Rohmer, after all, co-wrote with Claude Chabrol, the first serious critical book on Hitchcock, and here works up a considerable degree of suspense as the parallel matchmaking conspiracies unravel. Even after everything seems to have resolved itself into a happy ending, Rohmer throws in a final surprise: a brief close up of Isabelle’s anxious face, gazing wistfully over her husband’s shoulder as they dance. Is she wondering what might have been perhaps? It’s a moment so subtle one might easily miss it, but it speaks volumes about the longing and restlessness felt even by those, who, on the surface, might appear happily settled and contented with their lives. Much of the film’s success can be attributed to the two leads, Marie Rivière and Béatrice Romand, who put so much of themselves into their roles that we begin to feel we know them personally. Together they had appeared in ten Rohmer films prior to co-starring in An Autumn Tale and at times it’s as if we were watching older versions of the characters they played in The Green Ray (1986) and Claire’s Knee (1970). Passionate about her vineyard, Romand’s Magali is inclined to scepticism when it comes to her romantic prospects, which makes her eventual change of heart all the more touching. In many ways her opposite, Rivière’s Isabelle is all at sea in the countryside but eminently practical when it comes to human relations. Able support comes from the enchanting Alexia Portal, whose character, Rosine, is a more traditional Rohmarian heroine: young, attractive and articulate, but perhaps not quite as free of entanglements as she would like to believe. In contrast Alain Libolt’s Gerald harbours few illusions. Known primarily for his stage and television work, Libolt brings a winning vulnerability to the role of the middle-aged Gerald, who may well be the most sympathetic male character Eric Rohmer ever put on screen.